OPA, OUZO, and OLIVES are the first words I think of when I think of Greece. However, the first images that I remember of my trip to the Mykonos are always of the blue waters. As I would suggest all treat themselves to a trip to Mykonos, Greece, I would like a local to share her knowledge of the best of Mykonos. That’s why I contacted my peer travel writer, Georgia Skagos, to lend a hand with this Best of Mykonos Island, Greece. Enjoy! Opa! You have chosen Mykonos for your summer vacation and you feel excited about spending a few days in total luxury, relaxation, and fun. But you find it a little hard to make up your mind about where to stay and what to visit, as there are so many good accommodation venues, places to eat or drink and stores to go shopping. Here we give you some of the best hotels, restaurants, shops, and clubs to help you decide! Belvedere Hotel, just a few steps away from the central road of Mykonos Town, on a hill overlooking the city and the sea. Within its facilities and next to the huge infinity swimming pool you will find the famous Nobu Matsuhisa gourmet restaurant with Japanese cuisine. Belvedere has a second restaurant, Thea, with Greek dishes, 2 bars, 2 stores and an award-winning cellar with some rare and expensive labels from all over the world. Santa Marina at Ornos Bay, the first five-star hotel that opened in Mykonos. One of its restaurants, Buddha Bar, is a new hot spot of the island, bringing the famous chain dishes and aesthetics to Mykonos. Bill & Coo Suites & Lounge, a luxury boutique hotel at Megali Ammos sandy beach, not far from Mykonos Town. It has a small number of luxurious suites and its open kitchen restaurant is one of the best fine dining places in Mykonos. Cavo Tagoo at the suburbs of Mykonos Town has 2 restaurants and suites with private pools and Jacuzzis. Its spa and wellness center is one of the best on the island. For a more luxurious, spacious and private accommodation, search through the many Mykonos Villas that are available for rent. Villa Mykonos can be found in the most beautiful areas of the island and they are the top choice for VIPs and celebrities. Eating out can be one of the most wonderful and unique experiences you will have at Mykonos. Some of the best restaurants have become all-day beach resorts, offering their guests a lot more than a fresh, delicious meal. At Nammos (Psarou Beach), Alemagou (Ftelia Beach) or Principote (Panormos Beach) you can literally spend a whole day full of activities and fun next to the sea. On one of the narrow alleys near the Old Port at Mykonos Town, you will find La maison de Katrin French restaurant. It is decorated in a traditional Cycladic style with tables both indoors and outdoors. Most of its guests are locals or returning visitors, as Katrin’s is not advertised widely but its food is excellent. Nobu is one of Belvedere hotel restaurants, run by the famous chef Nobu Matsuhisa and offering New Style Japanese cuisine. Pick a great wine from the long wine list and enjoy a tasteful dinner in an elegant atmosphere. In Mykonos, you will find the latest creations of the world’s most famous cloth or jewelry designers. 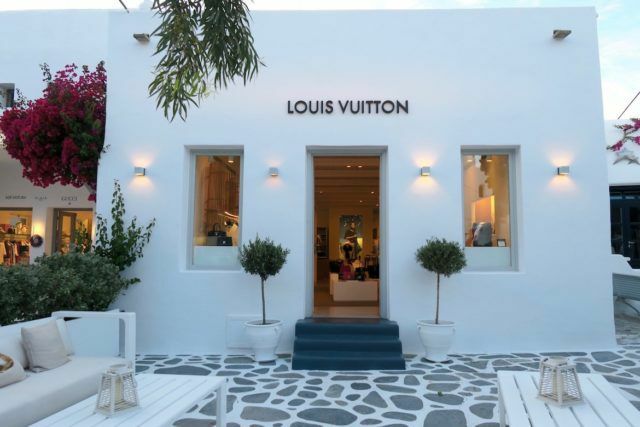 You will find out big brands have their own stores here, hidden in the small, beautiful streets of Mykonos Town. Some of them are Luis Vuitton (the famous bag designer), Chanel, Victoria Secret, Rousounelos Luxury Watches and Chopard boutique with fine jewelry. Mykonos shopping can be very pleasant as most of the famous shops are within a walking distance and, while walking, you can admire the traditional cubic white houses and stone paved narrow streets. For your night entertainment, we suggest some of the hottest spots of the island. They all play the latest beats and you can meet a lot of celebrities among their guests. In Mykonos Town, you will find Toy Room, a nightclub at Little Venice decorated as a playroom for children, Moni, the new addition to Mykonos nightlife, near the Old Port and Void, a big club with 3 different levels and famous DJs. If you prefer dancing under the stars next to the Ocean, Cavo Paradiso is the perfect place for you. It is located among the rocks near the famous Paradise Beach and attracts hundreds of guests every night.